If you require any further information, then just ask! 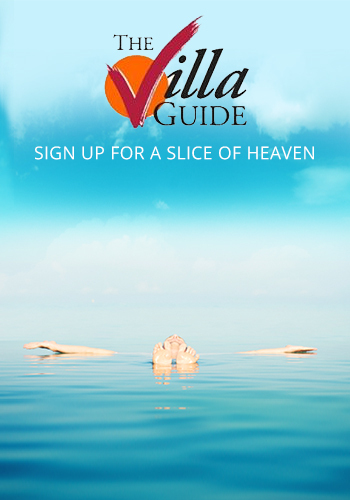 Because we are such intrepid, villa aficionados and every property on this site has been personally visited by our staff, chances are we'll know the answer and will be back to you quicker than you can say "I love the Villa Guide" . (well, we do try to respond the same day). In the unlikely situation we don't know the answer we will do everything to find it out, however please bear with us, this may not be as speedy, as not everyone works at our insatiable pace. Surya Damai, or ‘Peaceful Sun’ as it translates, is a name perfectly chosen for this enchanting Bali villa. Sunlight dapples through mature palms and flame trees lining 60m of river frontage with emerald rice terraces beyond in the tranquil village of Umalas. Gentle breezes and the soft tinkling of water create an overwhelming sense of calm and well-being enhanced by the smiling ever attentive Balinese staff. Traditional tropical materials have been used in creating the villa, which was designed very much as a family home to be lived in and enjoyed – comfortable, practical and immediately welcoming. Alang alang thatch roofs, hard wood decks and local stone is used alongside polished cream terrazzo floors and carved wooden panelling, all of a very high quality and immaculately maintained. Individually selected furniture, artwork and artefacts create character adding to the understated comfortable elegance. pavilion overlooking the natural stone infinity-edge pool and well tended gardens. Meandering cut-stone pathways lead to individual dining and bedroom pavilions set close enough to be sociable (and in the case of families within easy sight and earshot) but with clever terracing and well planted gardens that also allow privacy. The villa’s five bedrooms sleep up to 14 people and boasts sufficient creature comforts to keep a group this size happy: from cable television and surround-sound stereo systems to table tennis and even its own full size tennis court. Should you wish to venture out of this idyllic setting, you are only a short drive from the popular neighbourhoods of Legian and Seminyak which offer an endless selection of colourful shopping, dining and nightlife options; villa staff are happy to make recommendations and reservations. Alternatively, the villa has an in-house cook, a well equipped kitchen and a fairly extensive menu, including children’s meals, so you won’t go hungry. The staff will also shop and prepare meals at your request with no charge other than the price of ingredients and of course you are welcome to cook your own meals if you wish.